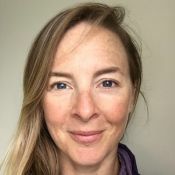 Senior Yoga Medicine® teacher Rachel Land offers simple, feel-good practices for increasing upper back mobility that are gentle enough to be included in a regular self-care routine. To function optimally, a body requires balance between its parts. Some parts of the body lend themselves to mobility and benefit from practices that provide stability. Others lend support and benefit from practices that maintain healthy flexibility and prevent rigidity. The thoracic spine, the stack of twelve vertebrae running from the bottom of our rib cage to the base of our neck, is one of the latter. There are a couple of reasons why the thoracic spine tends to be less mobile than the cervical spine (neck) and lumbar spine (low back). Firstly, our rib cage attaches to the sides of the thoracic vertebrae. And while it serves the vital role of protecting our heart and lungs, it also reduces the range of movement available to this part of the spine—especially in flexion (forward folds) and extension (backbends). Secondly, the natural shape of the thoracic spine is a gentle curve toward the front of the body, known as kyphosis. Over time the downward pull of gravity on the rib cage and shoulders can accentuate this rounded shape, especially as we age and become more entrenched in our posture and movement habits. Our muscles and fascia then reshape around that altered posture, restricting free movement further. The key to thoracic health isn’t extreme range of motion, it’s simple and functional movements of the mid back, ribs, and scapula that are gentle enough to repeat regularly. While we do need the protection the rib cage offers our vital organs, maintaining a healthy amount of movement in the thoracic spine prevents us from becoming locked into kyphosis. This makes it possible to maintain more natural posture, allowing for freer movement in our neck and shoulders, and reducing the load on our low back. As an added bonus, the reduced chest and abdominal compression created by standing and sitting more upright may even improve our breathing and the function of our digestive organs. The key to thoracic health isn’t extreme range of motion, it’s simple and functional movements of the mid back, ribs, and scapula that are gentle enough to repeat regularly as part of your self-care routine—such as the four outlined below. You’ll need a firm foam, wood, or cork block (a very soft foam block may not be stable enough to support your weight) and a blanket or towel. Once you’ve gathered your props, find an upright seated position you can maintain comfortably for a few minutes; that may mean sitting cross-legged on the edge of your folded blanket or towel, or kneeling with your seat resting on your block. 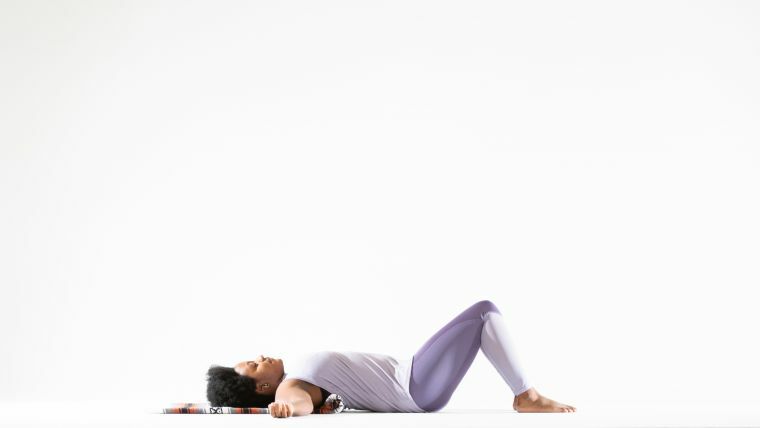 Find a relaxed position for your arms, soften the focus of your eyes, and bring your attention to the movement of your breath in your rib cage and back. Notice which parts of your rib cage move as you breathe, and which do not. This will provide you with a point of comparison between how you feel before mobilizing your thoracic spine and how you’ll feel afterward. Release your arms down by your sides and exhale. With your next breath in, turn your left palm up toward the ceiling, sweep your left arm up and overhead, and side bend your torso to the right. Allow your left shoulder blade to lift with your arm so that it glides over your back ribs. With your exhalation, return to your starting position. Repeat the same flow to the other side, inhaling as you lift your right arm to arc up and over to your left, and exhaling as you return to center. Continue to move smoothly side to side with the pace of your breath, imagining that you are lifting up and over a beach ball to focus the movement on your side ribs and scapulae instead of your side waist. After five or six rounds to each side, finish by side-bending toward your left and then return to your starting position. Rest in your upright seated position for a few deep and deliberate breaths. Allow your shoulder blades to rest on your rib cage and become aware of the ebb and flow of your breath. Notice any change in sensation compared to how you felt when you first sat down. Feel free to adjust your seated position or move around to ease any tension before you move on. From your upright seat, lift your arms out to your sides at shoulder height. Keeping your arms parallel to the floor and palms facing down, bend your elbows to right angles so that your fingertips now point in front of you. Take a smooth breath in, cinching in around your waist to lift your rib cage away from your hips and support your lumbar spine. With your next breath out, keep your nose and navel pointing forward but twist your rib cage to the right. Draw your right scapula back toward your spine and your left scapula forward toward your side ribs, using the asymmetric position of your shoulder blades to help you rotate a little further. Use your inhalation to return to center. On your next breath out, keep your navel and nose forward as you rotate your sternum to the left. Then speed up your movement, inhaling to the right and exhaling to the left. Continue rotating side to side with the rhythm of your breath, keeping your lumbar and cervical spine steady but gradually creating freer movement around your shoulder blades and mid back. Try increasing your speed further to see if it builds extra warmth and circulation. 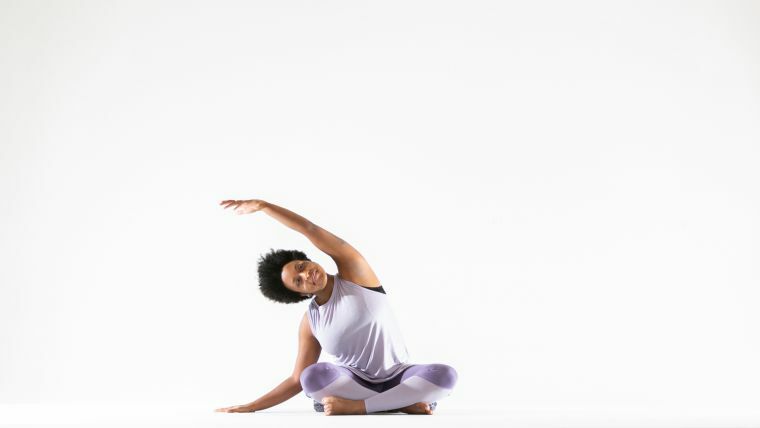 After 15 to 20 breaths, finish a twist toward your left, and then return to your starting position and allow your arms to drift back down by your sides. Take a few slower, deeper breaths, taking note of any change in sensation from the way you felt at the beginning of your practice. Bring your legs out in front of you, knees bent up toward the ceiling and feet on the floor at least hip width apart. Set your block behind you on its middle height, its long edge parallel to the short edge of your mat. Then recline back, positioning yourself so that the top edge of the block is just below the bottom of your shoulder blades. Bend your elbows, bringing your hands behind the back of your head to support its weight, and firm your abdominal muscles to support your lumbar spine. On your next inhale, allow the weight of your head to lower toward the mat, moving into slight thoracic extension while keeping the shape of your neck and low back unchanged. As you exhale, scoop your belly to lift your head up toward the ceiling, keeping the neck and lumbar spine as neutral as possible while actively rounding your thoracic spine. Don’t expect to move far; stabilizing the cervical and lumbar spines means that you’ll isolate your small natural range of thoracic flexion and extension rather than just moving as far as you can in each direction. Continue to oscillate your thoracic spine up toward the ceiling and down toward the floor with the pace of your breathing, using your arms to maintain a neutral neck and your abdominal muscles to maintain a neutral lower back. After five or six breaths, stay in the backbending position; draw your elbows toward each other in front of your face and allow your head to drop back, reaching your elbows overhead. Take a final breath or two into your side ribs. With your next exhale, draw your navel toward your spine to curl your head and shoulders away from the floor, returning to thoracic flexion. Then take your hands from behind your head and place them on the floor beside you to help you rise to an upright seat. Pause for a minute or two, noticing the movement of your rib cage as you breathe. Investigate how you feel now compared to how you felt previously. Firmly roll one end of your blanket or towel to about two inches in diameter. Set the roll parallel to the short ends of your mat with the loose section of the blanket or towel pointing toward the far end of your mat. 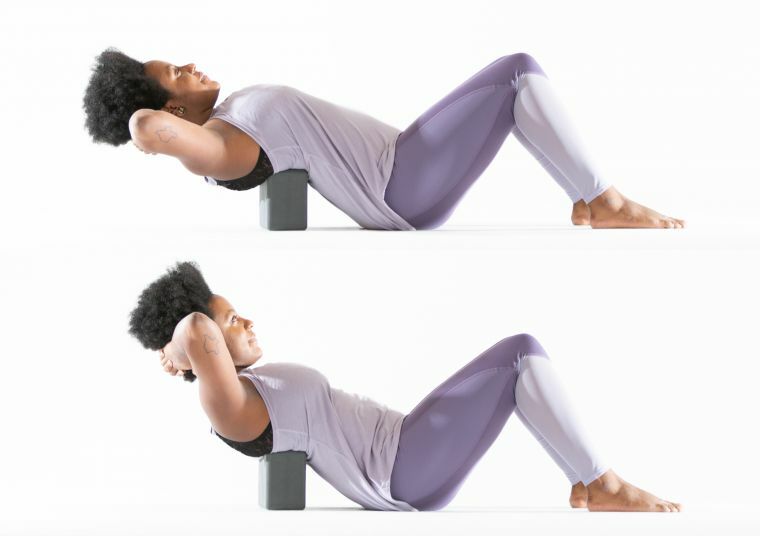 Lie back over your prop, positioning yourself so that the roll is perpendicular to your spine just below the bottom of your shoulder blades and your head and shoulders are cushioned on the remaining portion of blanket or towel. 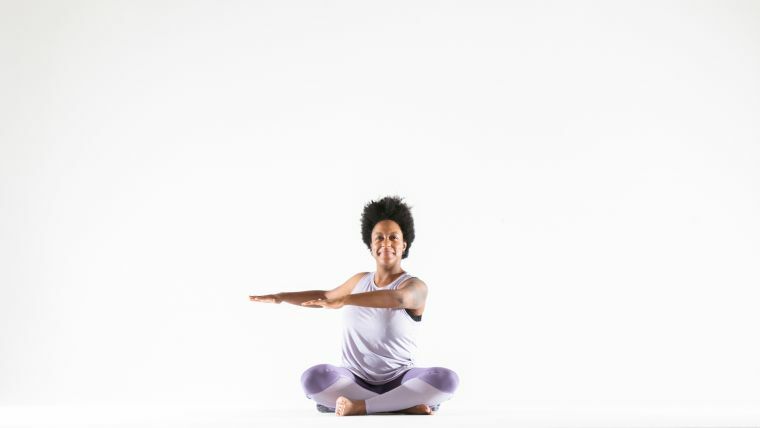 Your legs can be bent or straight, and your arms should rest comfortably on the floor above the rolled prop (either extended into a T shape or with elbows bent in a cactus shape). The prop should create a slight lift in your sternum, gently flaring your low ribs without causing discomfort in your spine. It’s important that you be comfortable enough to relax completely; if that’s not the case, try again with a smaller roll in your blanket or towel, or if necessary, come off the prop entirely and lie flat. Then leaving your upper arms on the floor, bend your elbows to bring one hand to rest on your rib cage and the other to rest on your belly. Once you’ve found a restful position, either close your eyes or soften your gaze. Now tune in to the natural movement of your breath. As your breath slows and deepens, feel your chest and belly expand into your hands with your in-breath and condense with your out-breath. Follow that sensation for five or six slow and steady breaths, perhaps pausing for a moment with your lungs full and again with your lungs empty. Then see if you can broaden your awareness beyond the movement against your hands. Notice movement in all directions—not just up toward the ceiling, but also expanding out into your side ribs and descending back toward your spine and kidneys. Pay particular attention to the areas that weren’t moving with your breath when you commenced practice, and see if they feel freer now. Stay with this practice for another minute or two. When you’re ready to finish, bend your knees and roll gently to one side, using your bottom arm or hand to cushion your head. Bring your top hand down to the floor in front of you and use it to help you press back to an upright seat. Take a final breath or two, and acknowledge any changes you’ve made. Our bodies function best when its parts work together to create a coordinated whole. While some areas, like the thoracic spine, serve us best when they provide a measure of structure and support, that stability can also tend toward rigidity, especially as we age. Maintaining natural mobility in the thoracic spine has positive effects on our posture and on the health of neighboring joints like our shoulders, cervical spine, and lumbar spine. It may even support healthy breathing mechanics and better digestion. However, thoracic health does not require massive range of motion. Gentle, simple, and repeatable movements around the mid back—such as the four outlined above—will have a more positive impact over the long term.